What happens on a catshow or "My second exhibition"
My name is Xara and I am a Norwegian Forest Cat. I live together with many other cats, our big and friendly dog Vasco (to be honest, for us he is a very, very big cat!... )and our "food suppliers" Daniela and Gundula. Sometimes they take us by car for a day out. There are two varieties - the first one is the visit to the Vet. Because this is not soo nice I better not tell you about it! But the second variety is to attend a cat show. I love it and would like to tell you more about it. 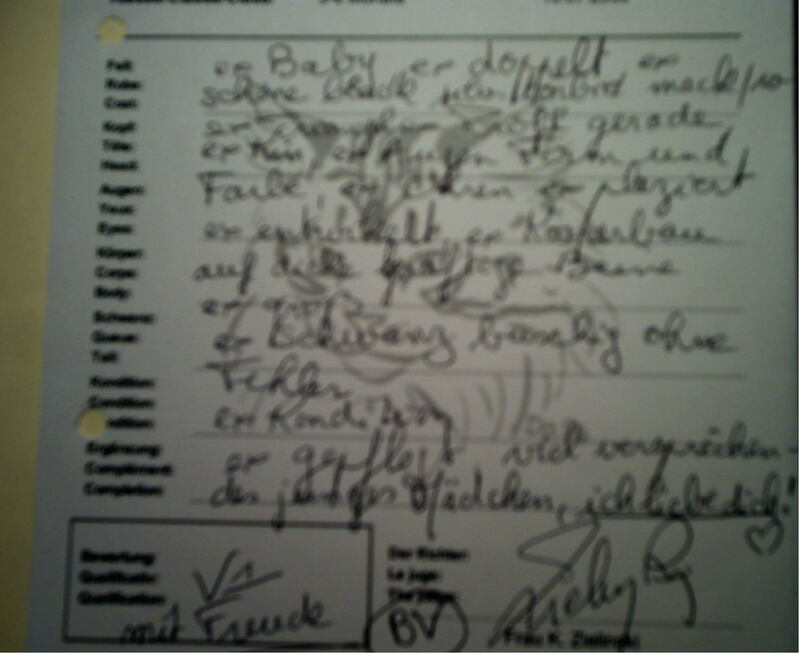 At my very first exhibition in "Hameln" everything was very strange and irritating. But my second show was much nicer and I realized: I love it! It all started Saturday after Dinner, when Gundula put all the important things like Vaccination reports, Registration and others in her bag and the cage decoration, litter pan, food and lots of treats in a suitcase. On Sunday morning everything was put in the car and I was choosen to come with them! I was so glad! Off we went to Hohen Neuendorf, a town situated near our Capitol Berlin. When the Vet found out that there were no parasites and I have all my vaccinations, my "food suppliers" could get our documents and pay the entrance fee. Now I had the possibility to catch a glimse of the hall, to find out, that there was an uncountable amount of cages with "fellows" and that the smell was more than interesting to me... It took some time for me to get used to the noise and the bustle of the people. My cage was decorated and after I moved in, I immediately did what I really like to do: "redecorating" and "scrambling around". Meanwhile Gundula and Daniela really enjoyed their first cup of coffee and I guess they had nice and funny talks with other "food suppliers", because they giggled a lot! Shortly after, Gundula went with me through the hall. "Ahh, I see: We are going to meet the judge!" I thought "Tail up, paws elongated, a bold, proud look - am I beautiful!?!.. The judge carefully examined me, looked me in the eyes, yanked my nose and before I could be really angry, she showed me a long, wonderful feather... Ohhh, she is nice and wants to play with me....So I put my ears up and accepted the invitation to play with her. But I think she had at least no time to play...She kissed me quickly and wrote a long report. Back into my beautifully decorated cage I was. A short while after - my "food suppliers" poured themselves another cup of coffee - it started to be bustling again. Out of the cage and off through the hall again! Straight ahead to the stage. On stage we stood, when a man said something about "best tortie-tabby in the category Semilonghair" and gave Gundula a beautiful cup. I was only interested in the little bag, that Gundula got as well - treats for me??? 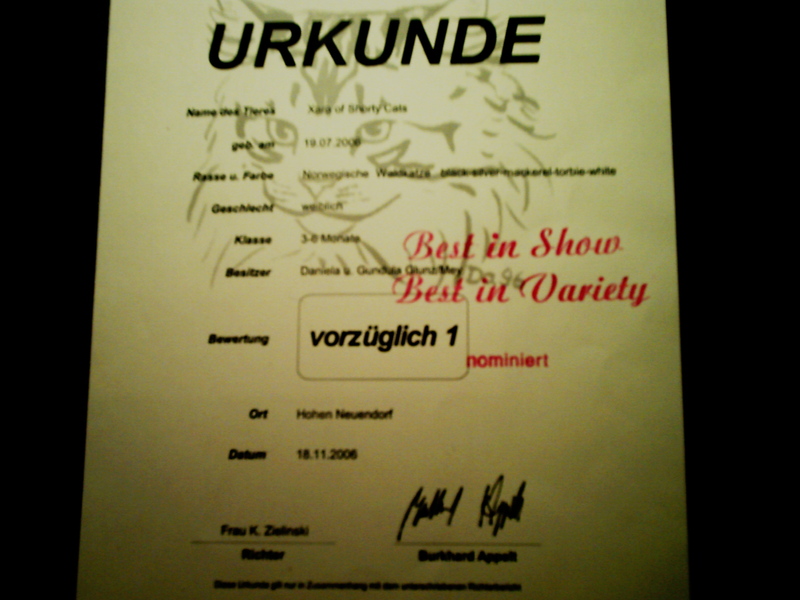 Daniela congratulated me to "Best Variety"
Then it was lunchtime. To the left and to the right, all the cats made it themselves confortable and cosy! I also really enjoyed my hobby: beauty sleep. A strange atmosphere waked me up. Everywhere I saw nervous people and they all seemed to wait for something. And really - there was this friendly young man again, giving away little notes. That is what all the people were waiting for! The Nominations! Gundula, too, got a note with a number on it and explained to me: "You are nominated for the Best in Show! Now you will be judged with a lot of cats in your category (Semilonghair, 3-6 month of age) to find out, which one is the best..." Hey - what is this explanation for!! I am a specialist, I know what that means! It was the same on my first show! A nice woman called a number and I was kissed spontaneously by Gundula! I made it and was the best semilonghair cat, 3-6 month!!! At the end the certificate was handed out. After packing everything in the suitcase and bag again, I took a comfortable seat in the kennel and we drove home. At home we all were happy and very tired.